Keep your child safe from exposure to germs and mess in public bathrooms with these travel packs. 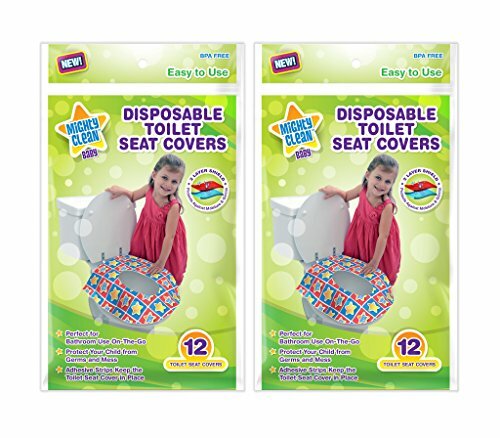 The covers are large enough so that your child can sit on them and hold on - without having to touch the toilet seat. The covers are soft and absorbent with a plastic liner to safeguard skin from moisture. No more worrying about what might be on the seat, wherever you are. Adhesive strips on the bottom of the toilet seat cover keep it in place. Perfect for travel and on the go - for adults, toddlers, and kids! You can also try using them at home for help with potty training. Appealing design that is perfect for boys and girls.